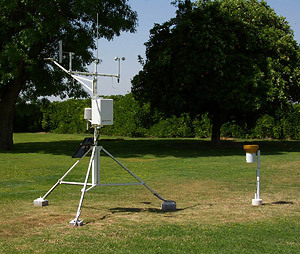 CIMIS, the California Irrigation Management Information System, is a network of almost 100 computerized weather stations, located at key agricultural and urban sites throughout California. The CIMIS program was developed by the California Department of Water Resources (DWR) and the University of California (UC) to help agricultural growers and landscape managers irrigate more efficiently. To find information from the CIMIS Station #182, located at the District Head Quarters, visit this site http://wwwcimis.water.ca.gov/cimis/data.jsp. Registration is free of charge. White River is an intermittent waterway that traverses the District flowing from east to west. The White River watershed is located in the Sierra Nevada Mountains immediately east of the District and historically ended in an undefined flood plain that eventually saw its flow reach Tulare Lake. The District owns a small section of the White River channel, approximately one mile in length. Other than this section, the District has no responsibility for operation and maintenance for the White River channel. However, as a public service to the District landowners and surrounding communities, the District has been instrumental in establishing three gauging stations along the river. The District and others use these stations to monitor river levels, rainfall, and other meteorological conditions. Station data can be accessed by visiting http://cdec.water.ca.gov/cgi-progs/staMeta?station_id=white+river.